The tax value of homeownership is declining. Is this a good thing or a bad thing? The answer, of course, may depend upon whether you’re an investor or a prospective homeowner. In 2017, Congress made the most significant tax reform in over 30 years. Included in the tax reform package was a doubling of the standard deduction and further limitations on itemized deductions. As much as tax reform was needed, one of its effects was a decrease in the tax value of homeownership. By doubling the standard deduction, the two most significant itemized deductions – charitable giving and deduction of mortgage interest – were suddenly made less valuable. It’s not that the 2017 reforms increased taxes. They lowered the overall tax burden on 80 percent of American families by an average of around 20%. The tax package did, however, have differentiated impacts on economic industries, and one of them was housing. The housing story matters, and it matters a lot. Prior to passage of the Tax Cuts and Jobs Relief Act, families typically reduced their tax liability by paying interest on their mortgage. For example, suppose you’re a “typical” earning family in the U.S, making around $70,000 with two dependent children. Suppose you purchased a $300,000 single-family home, with a house payment of $1,500 each month. Of your $18,000 in calendar year home payments, suppose $14,000 is interest. Next, suppose you contribute $7,000 to charities. Summing the $14,000 and the $7,000 is $21,000. The Tax Cuts and Jobs Act increased the standard deduction to $24,000 for a typical family. This means that the $21,000 is less than the $24,000 standard deduction. So, you take the standard deduction. This means that $14,000 in interest paid that used to be tax advantaged is basically wasted interest payments (from a tax perspective). In addition to paying interest on a home less lucrative, the Tax Cuts and Jobs Relief Act also made paying property taxes less desirable. Essentially, if the property taxes you paid don’t push your family over the $24,000 limit, then they were also less lucrative from a federal income tax perspective. How much is the change? The tax value of homeownership for this hypothetical family is -$11,000. Prior to federal tax reform, it was +$10,000. This comes to a net loss of -$1,000. This no doubt lowers the incentive to buy a starter home, particularly for Millennials and Generation Z, two groups already on the fence about the future of American capitalism. 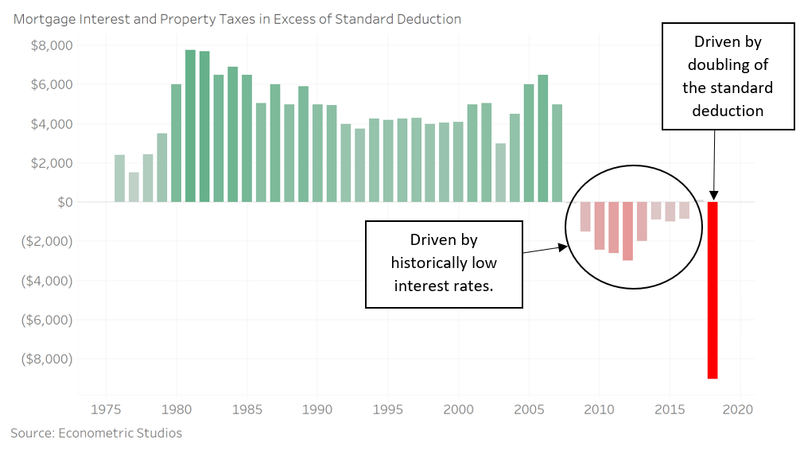 Here’s a look at the recent history of the tax value of homeownership. Up until the era of ultra-low interest rates, the tax value of homeownership was always positive, typically around $6,000 each year. 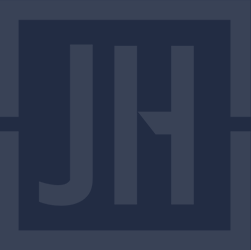 When the Federal Reserve decided to lower the value of homeownership, it suddenly made owning a home from an interest rate perspective more desirable but made the tax value of homeownership less desirable. The biggest change occurred in 2018 with the doubling of the standard deduction. The effect of doubling the standard deduction meant the tax value of homeownership turned far south, to minus-$9,000. Not pretty, not pretty at all if you’re a potential homeowner or a current homeowner that was taking advantage of the mortgage interest deduction. It could, however, be a good sign for investors with income properties.